In typical toddler fashion, my youngest daughter (aged two and a half) has developed the “NO! I don’t like it!”, and the “Don’t want it!” approach to almost everything offered, much to the delight of her parents (that’s me). If you’re a parent or teacher of children anywhere between two and five years old, and understand the complexities of little independent, strong-willed minds, then these few books are perfect for lightening the mood and reinforcing positive behaviour. 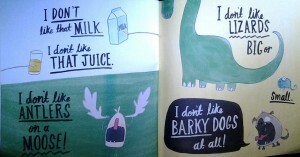 I Don’t Want to Eat My Dinner, David Cornish (author, illus. 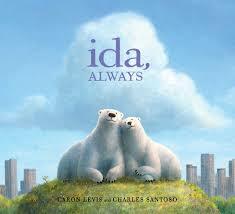 ), Harper Collins Publishers, 2014. 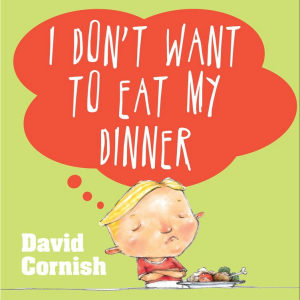 Shortlisted in the 2015 Speech Pathology Australia Book of the Year Awards (3-5 years) is the subtly coercing ‘I Don’t Want to Eat My Dinner’ by David Cornish. 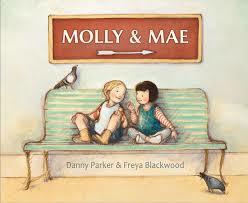 My youngest child loves this book (okay maybe there’s something she likes!) with its repetitive and funny phrasing, bold and in-your-face animated scenes and familiar culinary dishes. My only wish is that Rollo would convince her to eat her meals. We’ve tried pretending to be hungry dinosaurs gnashing on our leafy greens. We’ve tried transforming into intergalactic smush beasts and firing carrots into our mouths like Rollo did. Alright, I admit we haven’t ridden on a chicken drumstick like a knight in shining armour. But none of these approaches seem to work. She won’t fall for it. But when Rollo (and my daughter’s older sister) are seen polishing off their dessert, my little one is always quick to want to get to that part! 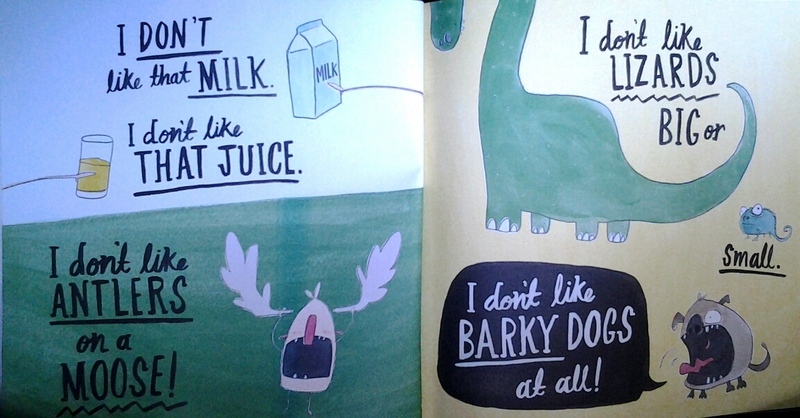 ‘I Don’t Want to Eat My Dinner’ is cleverly and humorously written and illustrated to have readers fascinated by the realms of imagination, as well as exploring fun ways to encourage the pickiest of eaters to gobble up everything on their dinner plate. Perhaps my little girl is still a bit young for this kind of pretend play, but parents of fussy kids from age four will relish having this savory book as a handy recipe for quenching those dinner time blues (and greens). 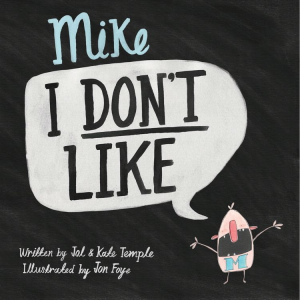 Mike I Don’t Like, Jol and Kate Temple (authors), Jon Foye (illustrator), ABC Books, 2014. 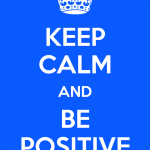 Shortlisted in the 2015 Speech Pathology Australia Book of the Year Awards (3-5 years). If there’s one thing in the world that makes you happy, could it be ice cream by any chance? It definitely does for Rollo and for my little girl, but for Mike I Don’t Like, that’s about all he likes. He’s so picky about his tastes that he goes as far as disowning his own book! When his friend kindly offers him half his sandwich, Mike berrates the poor fellow, going off about the way it smells, and looks, and his dislike for his lunchbox and books. Mike’s rant continues. Lizards, barky dogs, meowing cats, washing his hair, worms and bugs, lice, baths, flowers, cheese, pickles, tickles, bats, shoes, smells from kangaroos, carrots, gibbons squawking, kisses, crabs, blue whales, spooky barn owls, packing away and pirate parties, are just some of the few things on his ‘dislikes’ list! Until he spots that ice cream… I wonder if Mike will get what he deserves? An absolutely hilarious performance by Mike I Don’t Like with his ranting rhyming couplets in bold and capitalised handwritten text. The big-mouthed, egg-shaped Mike with his skinny arms and legs, scarce teeth and tiny beady eyes makes for a perfect-looking brat. The punchy, eye-catching and farcical illustrations immediately get you smiling, and by the end of the book, with its clever punch line to wrap it up, you’ll be whinging about having sore cheeks. 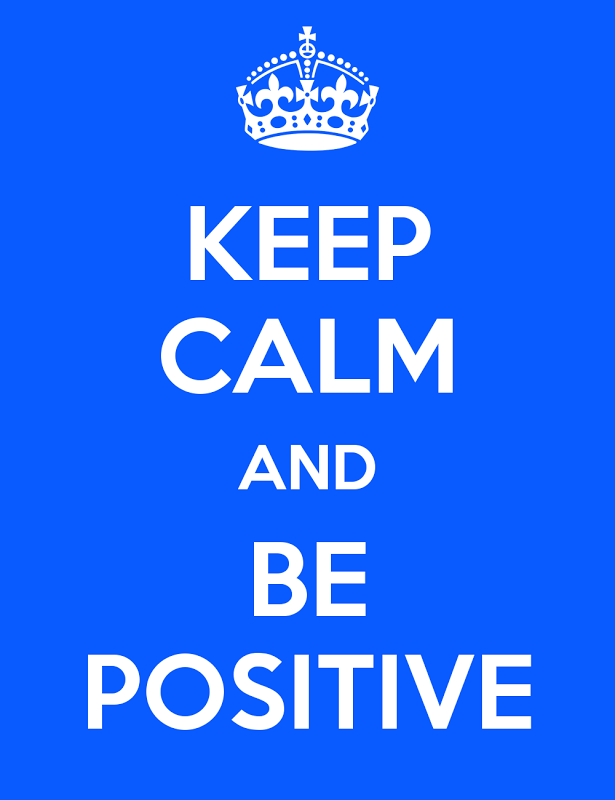 Ingenious, hysterical and completely over the top, ‘Mike I Don’t Like’ is a sure fire way of teaching those youngsters this important lesson: Keep Calm and Be Positive. 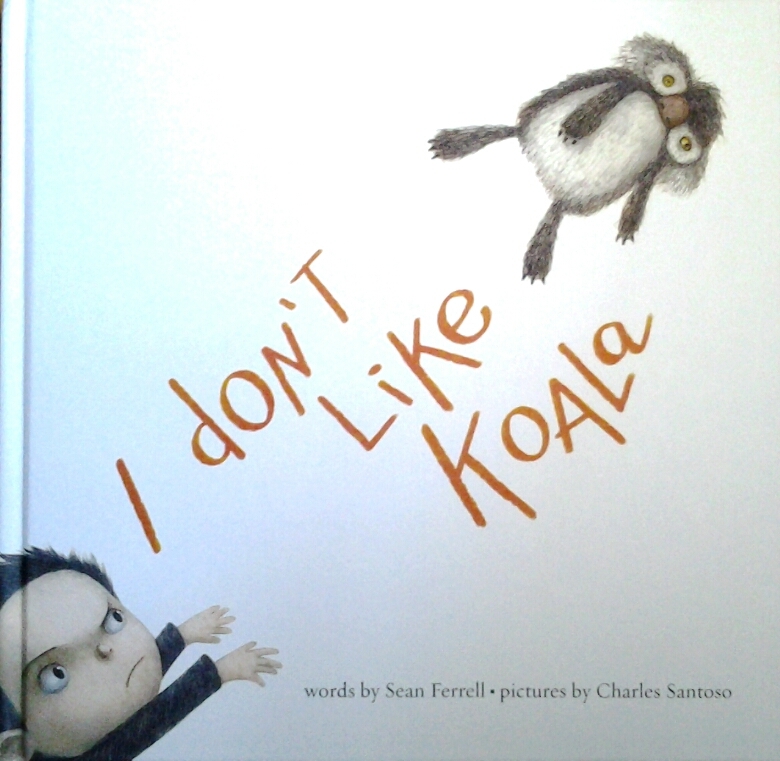 I Don’t Like Koala, Sean Ferrell (author), Charles Santoso (illus. ), Scholastic, 2015. Now here’s a boy who knows exactly what he doesn’t like…it’s his toy Koala. Adam is horrified when he opens his gift only to discover the most terrible terrible that ever was. With his stalking, asymmetric yellow eyes and his mysterious appearances at every turn, this creepy toy would give anybody the heebie-jeebies. But what to do with an unwanted toy? Put it away…away is a lot of places. Take it far, far away…far away is closer than you think. 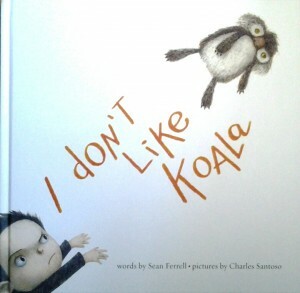 Adam shouts, “I don’t like Koala!” but his parents ignore his pleads for help. Finally Adam comes to realise that Koala, with his terrible terrible face and his terrible terrible claws and his watching, watching eyes, is in fact, just the comfort he needs. And who is freaked out by Koala now? Another cleverly written story that keeps us guessing, giggling, and a bit on edge is unequivocally matched with the quirky and melodramatic illustrations that add so much charisma to every scene. Santoso’s pencil etching technique and moody hues create a perfect sense of movement and verve through a tale that is somewhat dark and distrurbing. 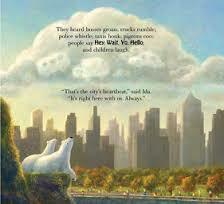 Although Adam doesn’t like Koala, plenty of preschoolers will adore the cheekiness, frivolity and affection that emanates from this imaginative story of overcoming fear and asserting one’s independence. It’s wicked!